There are many different reasons why you would want to deploy your builds from Visual Studio Online build system directly to your Azure VM. You might have test or staging environment running on Azure and you want to setup contentious integration build to run every time someone of you teammates checks something in. After each build run is finished it would be nice to for latest changes to be deployed automatically so that your test team can get latest version as soon as possible without you doing the deployment manually. In essence we want to make WebDeploy profile for our application and instruct MSBuild running on Visual Studio Online to execute that profile once build run is finished. At the moment of writing this there are some improvements to this process on VS Online portal so you might check that out but my approach might be better for simpler use-cases. It doesn't necessarily have to be Azure Cloud virtual machine, it could be machine running anywhere even your local on premise server as long as it is publicly accessible and running IIS Web Deploy agent. For sake of this example I will use Azure VM. First we need to create Web Deploy Publishing profile for our application. In solution explorer right click on project you want to deploy and click on Publish. When dialog pops up expand it by clicking on More Options to reveal Microsoft Azure Virtual Machines. From there you can pick up existing VM running on Azure or create new one. From this dialog you can create new VM and make sure to check "Enable IIS and Web Deploy" because it will make configuration a lot easier. If already have your existing machine running here are detailed instructions how to enable IIS and Web Deploy. If you are creating new VM pay attention to Visual Studio Output window because this process can take some time. Now that we have our machine ready for hosting and accepting our deployments it's time to configure our Build. Once again I will use Visual Studio Online Builds but same method applies if you are running Team Foundation Server on premise or even if you are just building your solution from command line manually or using scripts. Point is, whatever method for compiling your application you are using it will directly or indirectly run MSBuild in background and MSBuild can run our Publish profile as part of the process. At the moment of writing creating build process directly in VS Online portal in browser is still in beta so I will do it from local Visual Studio. First make sure that you commit at least one version of your solution to source control because you will need it to define build process. It doesn't matter if you are using Team Foundation or Git VCS, VS Online Build will work with both. Switch to Team Explorer and click on Builds. From top of the window choose "New Build Definition". First step is quite self-explanatory. Leave it at enabled and give it some meaningful name. Give it some name that will clearly describe what application suite it is building, what configuration, how often (like nightly, CI etc.) because that list can grow over time. On Trigger tab choose how you want your build to run. Manually, on each check in etc. I want to have continuous integration, meaning on every source code change application will get built and deployed to my designated environment. Source Settings tab setts where your solution is to be found on VCS. Settings for Team Foundation Server and Git use different notation but Visual Studio should detect this step automatically if your code has already been committed (checked in) to VCS. On Build Defaults tab you can leave everything by default. Now we come to most important step of all. Build processing. Settings are split with semicolon. Configuration is "Debug" in this case. PublishProfile is the name of publishing profile we set up in first step. You can find it inside application Properties/Publish Profiles. It is the file with .pubxml extension. I found that "AllowUntrustedCertificate=True" and "VisualStudioVersion=12.0" are necessary for this process to work. Password had to be the one used by Web Deploy on your target server. Hit Save and you should be able to see your new Build definition inside Visual Studio Builds in Team Explorer as well as in Visual Studio Online. Right click on it and then on "Queue New Build". Your Build should kick of at this point and you should be able to see progress both in Visual Studio and VS Online Portal. If everything went ok with the build your application should be successfully deployed to target environment. Double-clicking on Build in both VS and VS Online Profile allows you to see logs and eventually diagnose if something went wrong. There is a special case when you have two or more Web type projects in solution(Web Application, Web Site, Web API). Even though you define publishing profile in specific project in solution and it works if you publish using wizards and UI from Visual Studio it will not work from the command line and build systems for that matter. It will not know which project it needs to be deployed with that specific profile. To work around that you need to add custom Property Group inside .proj file of application you want to deploy. Then you add this custom property you defined in project to MSBuild configuration arguments list and set it to true. Intel suggest here that this is the problem with precompiled headers but it turns out problems is in icl.exe (Intel compiler). It needs admin rights. You can either give it explicitly to icl.exe or start Visual Studio as Administrator. specified in 'LIB environment variable'. If you take a look at this folder, there is actually no "common\lib" sub folder. Solution: Simply create "common\lib" sub folders and rerun MSbuild. MSbuild doesn't actually need anything from this folder but it's set as input variable anyways during Visual Studio setup. Once again getting my hands dirty with old C++ MFC code and I ran into strange problem. It looks like this has been well-known issue since VS 6.0 over VS2005 up to newest 2010 version. 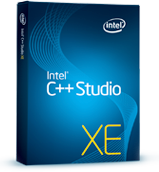 If you are trying to debug C++ MFC application on 64Bit OS using Visual Studio 2010 you will most likely get System.AccessViolationException in “Unknow Module”. Did some research over MSDN and as it turns out only solution to this problem is to disable RPC debugging. 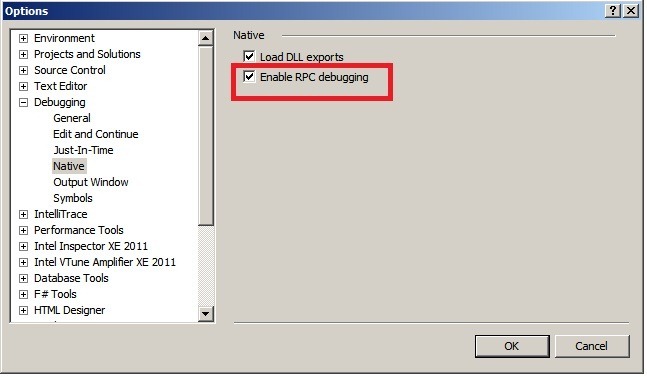 In Visual Studio go to Tools->Options->Debugging->Native and just uncheck “Enable RPC debugging”. This setting is always enabled by default. I will defiantly find my own post search for this solution in near future . Hope it helps you and please don’t use MFC any more .